Scars and stretch marks can have a major impact on your self-esteem and body confidence, and it can sometimes feel as though there is nothing you can do about them. The good news is that you no longer have to live with these unsightly blemishes. At Bodyvie, we use a sophisticated laser treatment called Fraxel to help rid you of scars and stretch marks. 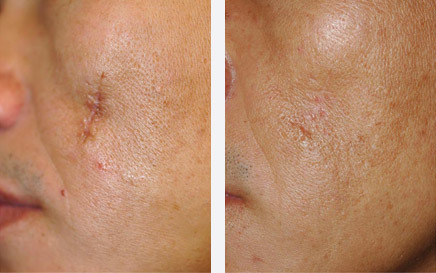 Fraxel is an advanced therapy that uses clever laser technology to repair damaged skin. It allows our doctors to be extremely precise in targeting scars and stretch marks. Fraxel works by penetrating laser energy deep within the layers of your skin, which gets rid of poor quality or dead skin cells and stimulates the production of collagen, the protein that keeps your skin supple and healthy. This treatment therefore harnesses the power of your body’s own natural skin-healing properties that help produce tighter, brighter, more refined skin. Your Fraxel treatment will start with an in-depth consultation to help us understand what you want to achieve from your treatment. The procedure itself will last up to 45 minutes, and as there is very little downtime from this non-invasive treatment, you should be able to resume your everyday activities soon after. The results will start to take effect over the following weeks. Fraxel is also used to treat other skin problems such as fine lines and wrinkles, sun spots and age spots, giving you a more youthful, radiant appearance. Each treatment may vary from one person to another. Arrange for a Fraxel consultation today and start changing the way you feel about your skin. The Fraxel treatment is relatively comfortable, though you may experience a sensation that feels like mild sunburn immediately afterwards. This will soon subside. The number of treatments required will depend on the size and nature of your scarring, but you are likely to require a course of up to five treatments to achieve optimal results.